Waddle Dee Army (ワドルディ軍団, Waddle Dee Corps) is King Dedede's Final Smash in Super Smash Bros. Brawl. He whistles and dances to summon a large crowd of Waddle Dees that run across the stage for 10 seconds, damaging anything in their way and moving much more quickly than the Waddle Dees that King Dedede normally throws in Waddle Dee Toss. The stage background and obstacles also move more slowly than usual. Waddle Doos are also included in the crowd, although they do not shoot out any electricity beam but instead give an electric shock upon contact. The most dangerous part of this Final Smash is how Gordos are also among the crowd, as they have high damage and knockback. When a Waddle Dee/Doo appears and lands on the stage, they will lift their left leg up then will either run to the left or right. When a Gordo spawns, it will drop vertically and then bounce to the left or right twice before disappearing. When a Waddle Dee/Doo runs to edge of the stage, it will sometimes jump off or run off without jumping but if it lands on a platform, it will charge again. However, if it lands on another platform it will disappear. During the Final Smash, King Dedede is immobile as he dances, and is also invincible. The Waddle Dee Army gets its KOs by sweeping enemy players off the screen. Each Waddle Dee/Doo does low vertical knockback and a Gordo does strong diagonal knockback (Waddle Dee does 2%, Waddle Doo does 8% and Gordo does 15%) which, in great numbers on the ground, can rack up to a high amounts of damage (if character(s) are on the ground and are getting juggled by the stampede). During the Final Smash, Waddle Dees/Doos will damage upon contact. This is contrary to the Waddle Dee Toss in that Waddle Dees spawned as a result of that move do not damage except while being thrown. The Dees/Doos can still be attacked by characters or explosions, however there are so many of them that it is hard to fight them off. 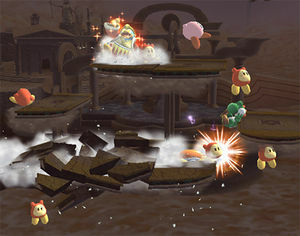 Most KOs dealt with this Final Smash usually result from the opponents not being able to recover very far from the stage, as the Waddle Dees and Waddle Doos are constantly attacking the enemy while he/she is off the stage, pushing him/her away from the stage while making him/her lose all jumps and their third jumps in the attempt to recover back. Another way for getting KOs is that the Gordos might hit a high percentage character, causing the character to fly upwards and get Star KOed. In addition, characters will get slowly pulled towards King Dedede during his Final Smash, but only if they are on the ground (but it can also work if they are under Dedede and they are not moving). It is easier for flying or floating characters to take little damage, as well as characters with a great recovery as they only need to keep jumping and/or using their up special. However, it is not easy as the Waddle Dees/Doos and Gordos appear in midair, and if a character is under one in midair, he/she will be pushed to the ground and then get pushed off by the army on the ground. This Final Smash is less effective with large stages that have a lot of platforms as the army will be separated. The dance that occurs in this move consists of King Dedede putting his mallet away, then facing the screen and whistling. The stage music is paused for 10 seconds while different music is played in its place. He then starts waving his left hand in a 'gimmie' style twice, does the same thing with his right, then repeats the motion with both of his hands. He does this 3 times (near the end of the Final Smash, he will begin to do it a fourth time but it will be cut off) and, finally, he puts his hands on his hips, laughs with angry eyes, and gets his mallet behind him, ready to be controlled. Like the Waddle Dee Toss, the Waddle Dee Army is an attack crafted specifically for Brawl, although King Dedede does command a large army of the creatures in the Kirby games. They feature prominently in many games, and Dedede would occasionally summon some Waddle Dees in a similar (though less profuse) manner to assist him in Kirby: Squeak Squad. While in general the frequency of each minion type is the same as the Waddle Dee Toss, Gordos are slightly more common (having a 11.8% chance to appear, instead of a 8.2% one). Five of the many army members will always spawn beneath King Dedede. Because of this, positioning King Dedede strategically above/standing on the stage/platform increases the Final Smash's effectiveness. If one has used Waddle Dee Toss and then use Waddle Dee Army, the army that comes from the Final Smash still hits the Waddle Dee/Doo that has been thrown by the Waddle Dee Toss. On the Waddle Dee Army trophy, no Gordos are present, despite appearing in the Final Smash. The Waddle Dee, Waddle Doo, and Gordo in Waddle Dee Army do less damage than Waddle Dee Toss. The Waddle Dees and Waddle Doos cannot be Inhaled or Chomped, unlike the ones thrown with the Waddle Dee Toss. This move is jokingly referred to by fans as the "Big Gay Dance" after a comedy skit in the Brawl Taunts webseries quadrilogy, done by Christopher Niosi and Kira Buckland. This page was last edited on February 28, 2019, at 18:19.